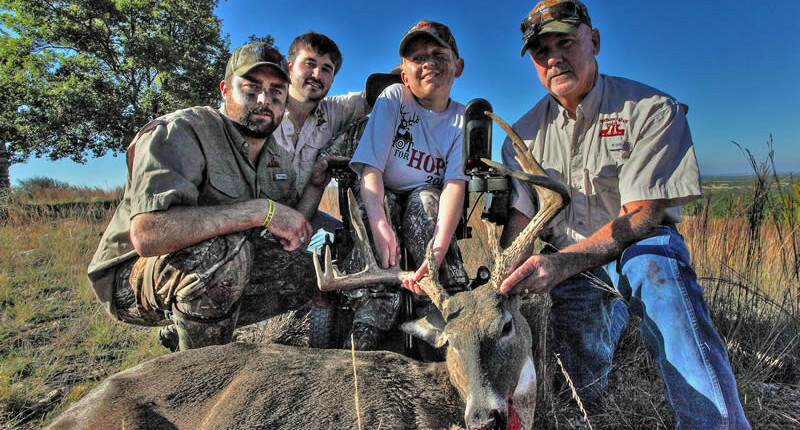 Trophy Texas Deer Hunting goes way beyond just game meat and the experience. If a large antler specimen is what’s missing from your deer hunting collection and you are looking for a Great Trophy Whitetail Deer Hunting experience then Contact Us now for more information and availability! The terrain at Compasso Ranch is mixed with some mesquite flats and some elevation with Spanish oaks and Post Oaks which create a rather majestic view and a great natural food source for our whitetail deer population. Most of our Deer Hunting stands and blinds are placed so you get the maximum viewing angles and can see more trophy deer so ultimately you have more shot opportunities for that Trophy buck . The deer hunting stands and blinds are situated as follows, we have one 20’ tower blind situated on a 35 acre wheat field where shots can range from 20 yds to 300 yds, one 10’ tall blind on two other wheat fields where shots would be no more than 150 yds. We have two more 20’ tower blinds situated on corn feeders with shots of about 125 yds. We have several 10’ tower blinds and ground blinds on corn feeders with shots from 50 yds to 125 yds. Generally your deer hunting day will start from sunup until around 10am, then we go back out again at about 3pm and hunt till dark. We will have a big breakfast after the morning hunt, usually a pot of stew or chili during the day to snack on before you go back out, then another big meal for dinner and we usually find that desert ends up being a lot of really good hunting stories from earlier in the day. Whitetail Deer Hunters will stay in our 2,400 square foot hunting lodge that can comfortably accommodate 8 hunters. The four bedroom, three bath lodge is equipped with direct TV, a full kitchen, a covered deer cleaning facility, walk in big game cooler, and an indoor and outdoor fireplace for your relaxation and enjoyment. Our full service whitetail hunting packages are all inclusive and include gourmet, home cooked meals for breakfast and dinner. Important Information about our Trophy Whitetail Deer Hunting packages: Due to limited supply and availability, all trophy whitetail hunts require $1,500 non-refundable deposit at the time of booking. Once the whitetail hunt has been booked, you will have 7 business days to send in your deposit. There is a $125/day guide fee that includes: experienced hunting guide, field dressing, caping for mount, skinning, quartering, and icing down your harvested meat for transportation. All of our Trophy Whitetail Deer Hunting Packages includes 2 doe if taken before 11/15. *All whitetail hunt prices include a management whitetail deer hunt, food, and lodging. Guide tips are not included in the prices. *Turkey Hunting can be added to any whitetail deer hunting package, when in season, for an additional $350/turkey. Call or Email us to for more information and to Book your next Texas Trophy Whitetail Hunt! Be sure and view our photo galleries for more examples of what you can expect on a Trophy Texas Deer Hunting Trip. Deer Hunting Pictures, Turkey Hunting Pictures or our Texas Exotic Hunts page. Looking to hunt a different type of game? We also offer Turkey Hunts, Dove Hunts, and Large Exotic Bucks. Ranked as one of the Top Texas Trophy Whitetail Deer Hunting Destinations in 2016 by Ranch Review and Outfitter Connection!